We are glad to share the Tyagaraja Kriti “Entha Nerchina Entha Juchina” set in Raga Suddha Dhanyasi. In this kriti Tyagaraja outpoures his anger on false people those who cheat and exploit people. The lyrics with meaning and the audio link sung by Smt M.L. Vasanthakumari is share in the following link. Have a nice Sunday and Independence Day. The real independence is to get freedom from our own Kama and Krodha. May the Lord shower his blessings on all. Those who do not always have the thought of the established path of Lord Vishnu – the beloved of Lakshmi – being one's indweller, no matter how learned one is, how vastness of experience and howsoever high and mighty one be, all are slaves of women. 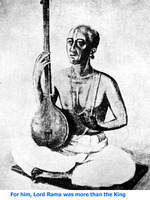 O Lord praised by this tyAgarAja! These kind of people indulge themselves in uttering falsehood for the sake of women and wealth of others, casting aspersions on people and exploiting them for personal gains.